Great folks very helpful made us feel right at home. I will be recommending your services to everyone I come across. Hope to be coming back after my wife and I renew our vows in December. 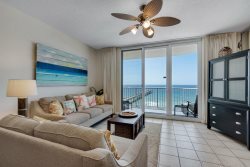 Second time to rent a beach front condo this year, I knew after working with The Summerwind team, I would do it again. Personable, easy and enjoyable. Family was again happy to be here, close to everything, Thank you! The condo was very nice and fit out needs perfectly, beautiful views and very clean. Loved the boardwalk to the beach. I liked the fact that the beach was not so crowded also. Overall I have nothing bad to say, it was all great! They were great! We needed them to come fix something and they were there within minutes! Easy checkin and checkout! Everyone was extremely friendly! No problems reaching someone and getting assistance. We had minor issue with leaking tub. It was addressed within 24 hrs. There we 2 other bathrooms so no big problem. We had a great time! I was nervous about it all working out as this was our first major vacation. It was also our first time renting a condo (usually hotel). There were 7 of us and this unit had plenty of space. Thank you for a wonderful stay and view! Everyone there was amazing and helpful with any question I've had. They help me locate great places to go and eat or activities to go do. I would recommend anyone to this property. Everything was absolutely wonderful. The only changes I would have made to or unit would be a little better patio furniture and larger selection of utensils in the kitchen. I.e. Scissors. Every time we contacted Navarre Properties everyone was helpful, kind, and informative. Great team! We loved our condo. It was clean and well stocked. The location on the beach was wonderful and the view was awesome!